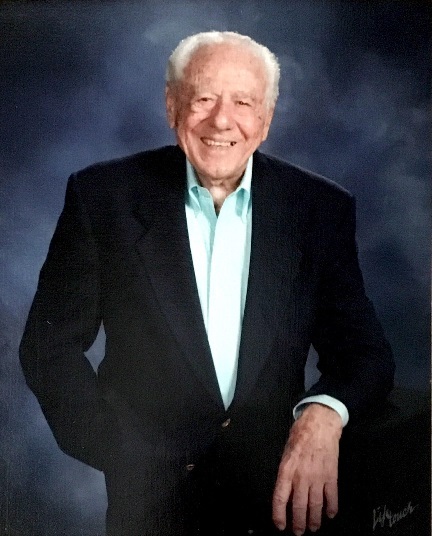 Dr. Anthony J. Romito, 95, Overland Park, KS, passed away May 10, 2018. Anthony was born in St. Louis, MO on July 17, 1922, the eldest of four children born to Charles and Rose (Luppino) Romito. He knew hard work from a very early age, having taken a job doing manual labor after graduating from grade school at the age of 13. Times were tough then; the Depression was at its peak and the year was 1936. In 1943, at the age of 21, Anthony volunteered for active duty in the Army Air Force where he served until the end of World War II, after which he enrolled in St. Louis University under the GI bill, majoring in Chemistry. He then accepted a position with a large Eastern chemical company, Merck & Company, serving as the company’s representative in Central Illinois for many years. In December of 1953, Anthony received a promotion, which required a move to the Kansas City area. While attending St. Louis University in 1948, Anthony met the best friend he would ever have, Wilma Masters, whom he married on December 11, 1948. The marriage proved beyond compatible despite the fact that Tony and Wilma came from widely diverse backgrounds. In 1959, Anthony Romito reluctantly left his beloved Merck & Company to pursue his childhood dream to become a physician, and at the age of 37, he enrolled as a first year student at the Kansas City University of Medicine and Biosciences, graduating in 1963. He opened his office on Troost Avenue, close to Baptist Hospital and Menorah Medical Center where he did general medical practice until retiring in June 1995. Dr. Romito enjoyed many hobbies including flying his plane, playing tennis, and SCUBA diving. Dr. Romito was preceded in death by his wife Wilma Romito, his parents, his sisters Margaret and Vera, and his daughter-in-law Dr. Cynthia Romito. Survivors include his son Dr. John Romito, four beautiful grandchildren: Diana Miller (Mark), Natalie Freeman (Douglas), Nick Romito (Shannon) and Marc Romito (Jennifer), 13 great grandchildren, and 2 great great grandchildren, all of whom he was very proud. He is also survived by his brother John C. Romito. Visitation will be 930-11AM, with Mass of Christian burial at 11AM, Wednesday, May 16, 2018 at Cure of Ars Catholic Church, 9401 Mission Rd. ; entombment in Prince of Peace Mausoleum at Resurrection Cemetery of Lenexa. The family requests no flowers but suggest memorial donations be made to Catholic Charities. Our condolences go out to Dr. John Romito, as well as to all of the grandchildren and their families. I regret not being able to attend the funeral services today, but I am with him in spirit. Uncle Tony was an incredibly accomplished man. We shared a mutual fondness and he will be sadly missed. A friend for life. I will miss him very much. We spent great times playing tennis all over KC. Both of us had great careers with pharmaceutical companies. I met Tony and Wilma when I was transferred to KC from Texas. He was the first friend I had in KC and lasted to this day. Tony was my best man when I married Nancy. He was always there for me when I needed him when I was going thru some rough times. We enjoyed talking about flying since he and Wilma and I are pilots. I was with him when he graduated medial school and spent nights with him at the hospital when he was an intern. Tony was a good and dedicated doctor. This is one of my greatest loss in life. Bless you Tony and Wilma.